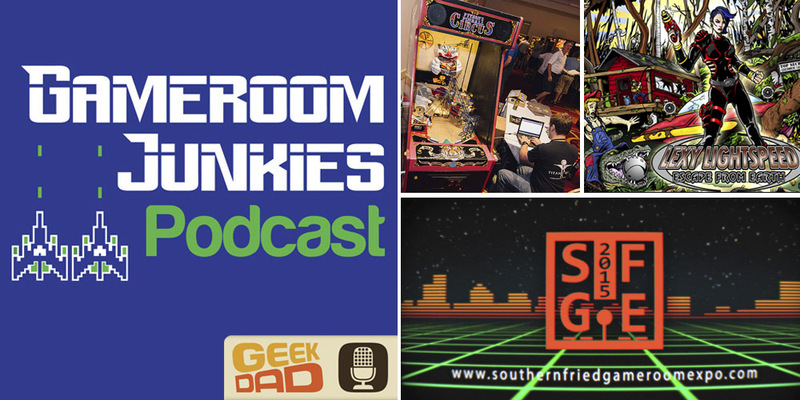 We’re back with another great episode of the Gameroom Junkies Podcast featuring a fantastic panel from the Southern-Fried Gameroom Expo. Patrick is out sick this episode, so our good friend Bryan is filling in as co-host. After some brief updates we dive into an overdue “console corner” segment for some talk about Rocket League, my confusion over Bayonetta, and more. After that we answer some listener questions about our thoughts on the new Guitar Hero versus Rock Band 4 this fall and our picks for the greatest shots in pinball. We close out our show with the audio from the SFGE panel “Coding and Creating: The Challenge of Creating Custom Games.” The panelists all have extensive experience creating custom games and overcoming obstacles. Speakers include Paul Kiefert (Python’s Pinball Circus), Gerry Stellenberg (P3 Pinball Platform), Scott Hale (Hale Games), and Jimmy Lipham (Demolition Man 2000). Discussion topics include first steps, programming tools of choice, and the inspiration for creating custom games, among others. Don’t forget, you can listen to Gameroom Junkies by using the streaming player above, or you can subscribe to us on iTunes or Stitcher. If you like the show, please leave us a review. You can also find us on social media though Facebook and Twitter. We hope you enjoy the show! The co-host of the Gameroom Junkies Podcast, Preston is a writer and designer living outside Atlanta, GA. He has an affinity for VHS tapes, and an obsession with arcade games and pinball machines. He is a contributing writer for GeekDad, Paste and RETRO Magazines, and a founder of the Southern-Fried Gameroom Expo.